INDIANAPOLIS, IN (February 7, 2013) — In an effort to continue minimizing the risk of injury in high school football, three additional rules will take effect next season to address helmets coming off players’ heads during games. 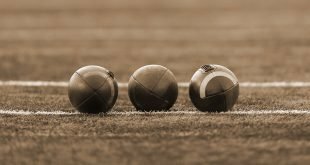 These three risk-minimization additions were among 10 rules changes approved by the National Federation of State High School Associations (NFHS) Football Rules Committee at its January 18-20 meeting in Indianapolis. All rules changes were subsequently approved by the NFHS Board of Directors. 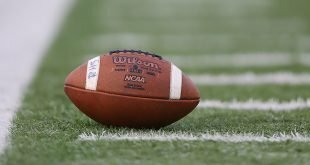 As a follow-up to last year’s rules change that requires players to sit out one play if their helmet comes off while the ball is live, the committee approved three additional rules that are extensions of last year’s change. The committee also added language to Rule 3-5-10 to clarify that if the helmet comes completely off during the down or subsequent dead-ball action related to the down – and is not directly attributable to a foul by the opponent – the player must leave the game for at least one down, with the exception of halftime or overtime intermission. When this occurs, an official’s time-out shall be called. Perhaps the most significant rules change next season will be one that reduces the penalty for pass interference. While the 15-yard penalty will remain for both offensive and defensive pass interference, the loss of down has been removed for offensive pass interference and the automatic first down has been eliminated for defensive pass interference. Another change at high school football games next year will be the expanded use of communication devices. In specific situations, coaches, players and nonplayers will be allowed to use any form of communication technology. This expansion of the rule allows the use of communication devices during authorized conferences outside the nine-yard marks, on the sidelines and during the halftime intermission. Use of communication devices by players except conferences outside the nine-yard mark continues to be prohibited. In Rule 2-4-1, the committee clarified the rule approved last year regarding the definition of a catch, which stated that a receiver is required to establish possession of the ball and contact the ground inbounds while maintaining possession – regardless of the opponent’s action. “The committee clarified the definition of a catch such that an airborne player who has forward progress stopped inbounds and is carried out of bounds by an opponent before contacting the ground is awarded a catch at the spot of forward progress,” Colgate said. In Rule 9-3-8, the committee added another provision to the rule enacted last year regarding contact by the kicking team against members of the receiving team. The new provision stipulates that the kicking team may initiate contact once the receiving team has initiated a block within the neutral zone. The committee also approved the addition of a 15-yard penalty to the existing option of accepting an awarded fair catch for kick-catch interference. Finally, in Rule 8-3-3, the committee clarified that the touchdown scoring team is the only team that can score on a try, and in Rule 1-5-3 the committee modified the rule regarding the wearing of towels. Football is the No. 1 participatory sport for boys at the high school level with 1,121,744 participants in the 2011-12 school year, according to the High School Athletics Participation Survey conducted by the NFHS through its member state associations. In addition, the survey indicated there were 1,805 girls who played football in 2011-12. The NFHS, based in Indianapolis, Indiana, is the national leadership organization for high school sports and performing arts activities. 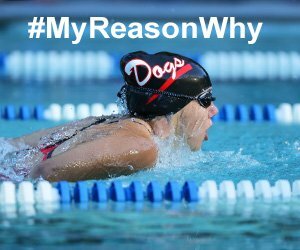 Since 1920, the NFHS has led the development of education-based interscholastic sports and performing arts activities that help students succeed in their lives. The NFHS sets direction for the future by building awareness and support, improving the participation experience, establishing consistent standards and rules for competition, and helping those who oversee high school sports and activities. The NFHS writes playing rules for 16 sports for boys and girls at the high school level. 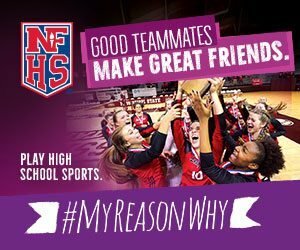 Through its 50 member state associations and the District of Columbia, the NFHS reaches more than 19,000 high schools and 11 million participants in high school activity programs, including more than 7.6 million in high school sports. As the recognized national authority on interscholastic activity programs, the NFHS conducts national meetings; sanctions interstate events; offers online publications and services for high school coaches and officials; sponsors professional organizations for high school coaches, officials, speech and debate coaches, and music adjudicators; serves as the national source for interscholastic coach training; and serves as a national information resource of interscholastic athletics and activities. For more information about the NFHS, visit www.nfhs.org. Access and order NFHS Coach Education courses at www.nfhslearn.com.